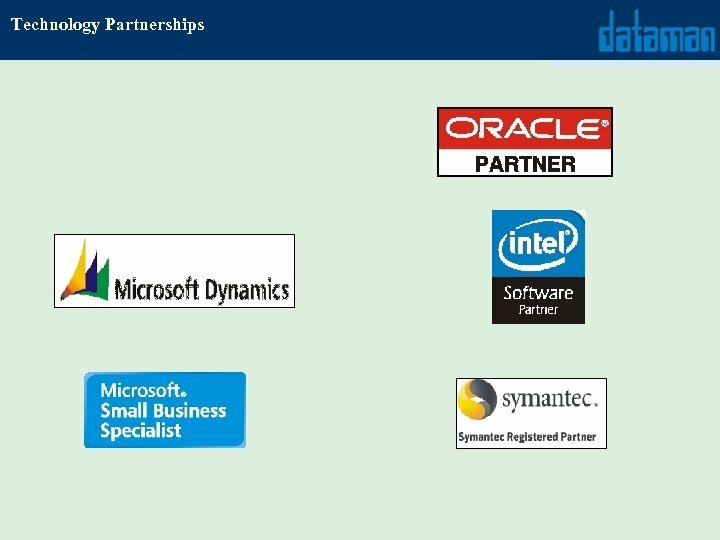 About Dataman Established in 1990 Team : over 150 professionals Channel Partner to Microsoft & Oracle Inc. Clientele : Over 5000 spread in more than 100 cities Products : Over 10 Established Products Outsourcing : U. S. A, U. K. and Sweden Expertise : Database : X-Base, Unify, MS-SQL Server, Oracle Platform : ASP, . 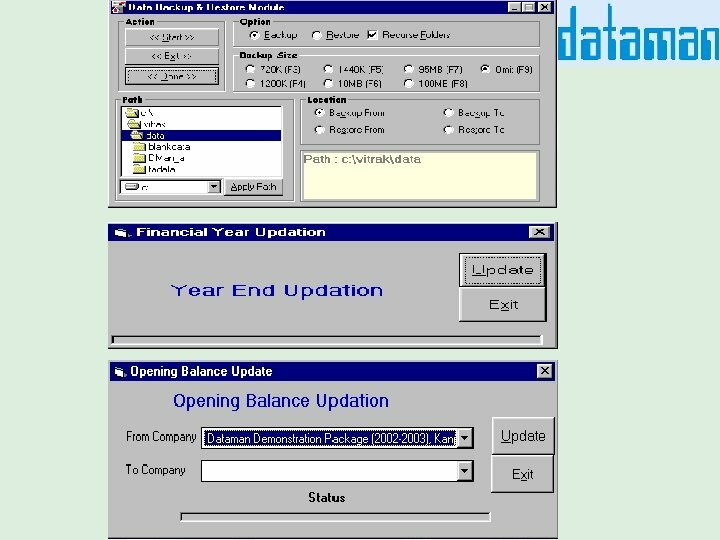 NET, JAVA, Macromedia, Windows Language: VB , . 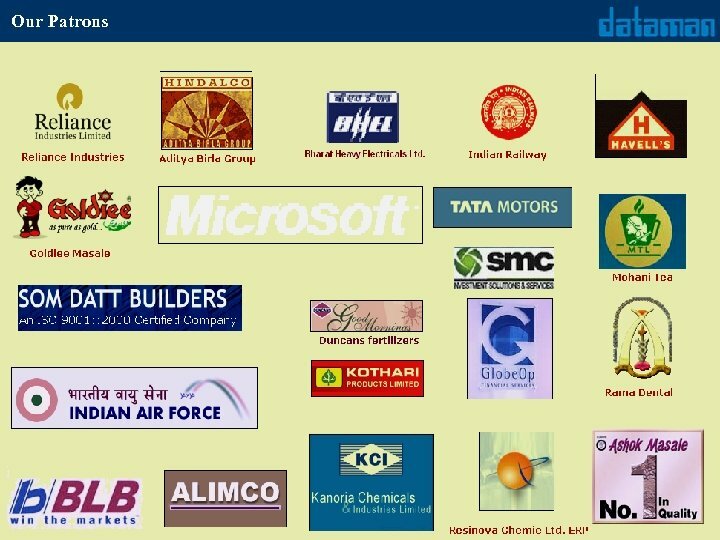 NET, C++, C, Delphi, PB, Clipper Domains : Hospitality Industry, HR, Finance, Banking, Marketing, Health Care, Materials, Manufacturing, Web Based Solutions, ERP etc. 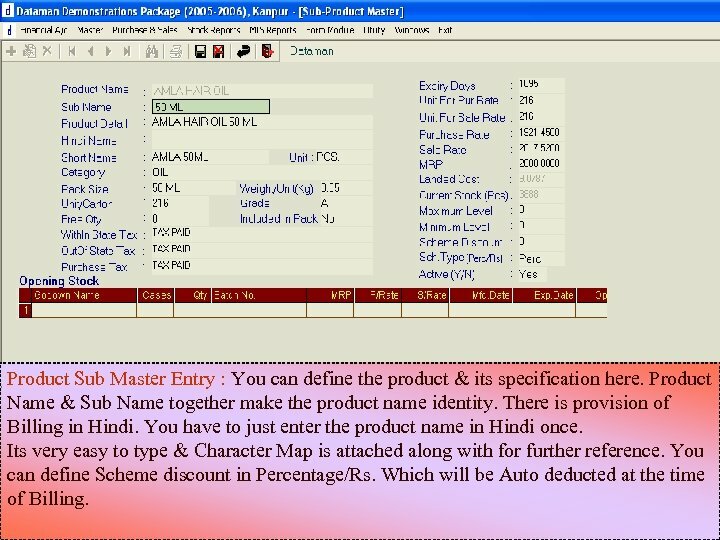 Product Sub Master Entry : You can define the product & its specification here. 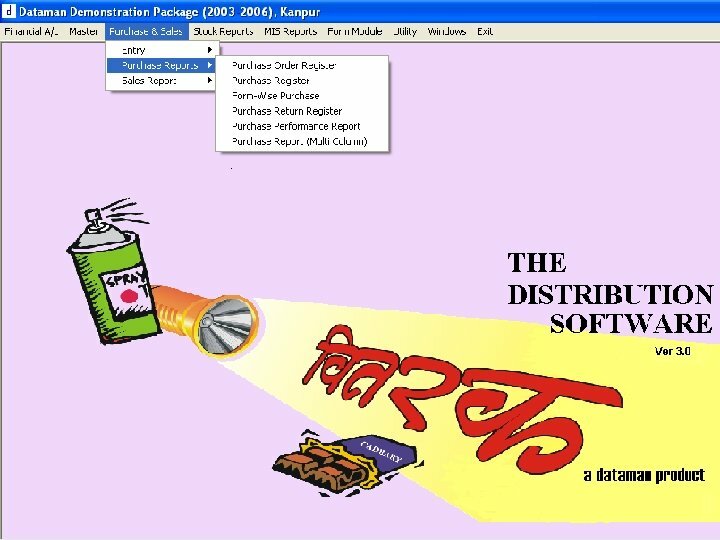 Product Name & Sub Name together make the product name identity. 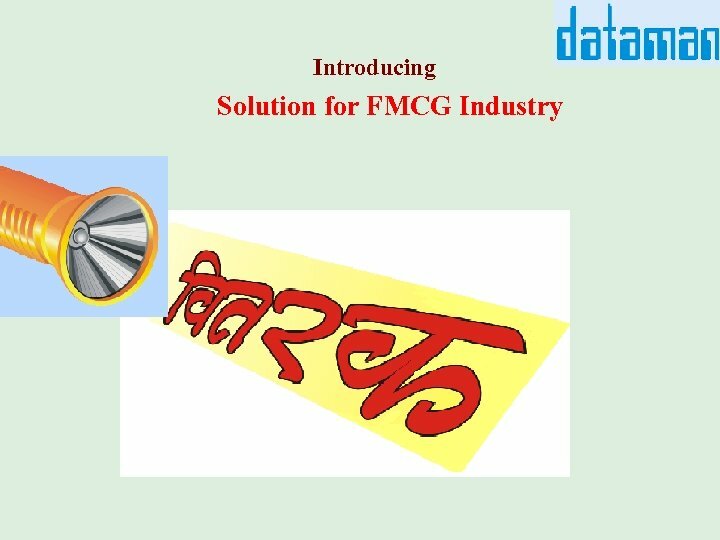 There is provision of Billing in Hindi. You have to just enter the product name in Hindi once. 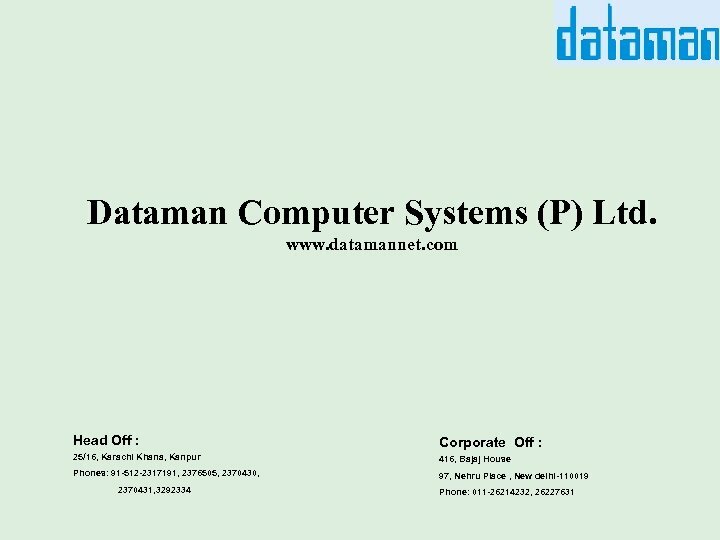 Its very easy to type & Character Map is attached along with for further reference. 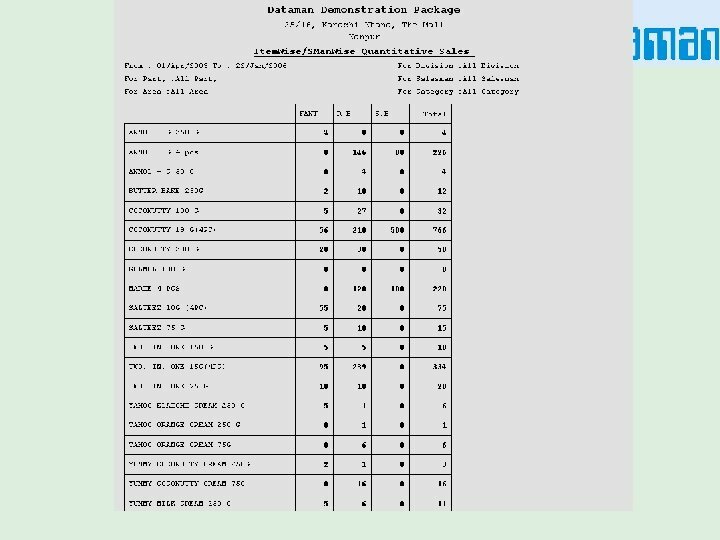 You can define Scheme discount in Percentage/Rs. 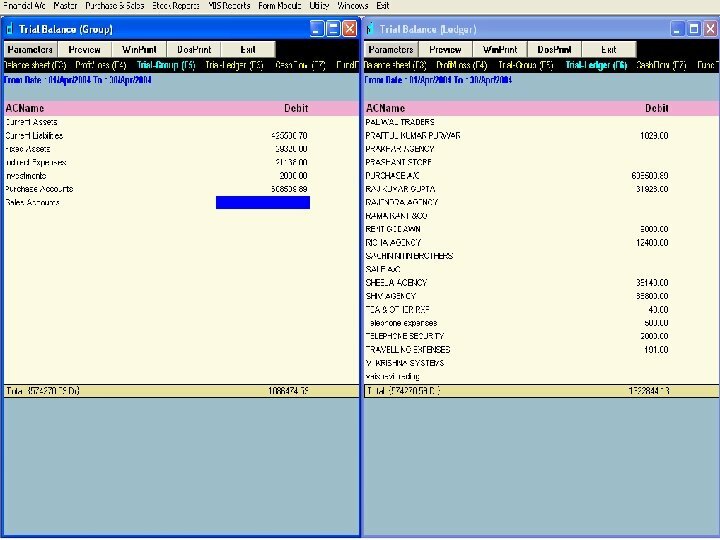 Which will be Auto deducted at the time of Billing. 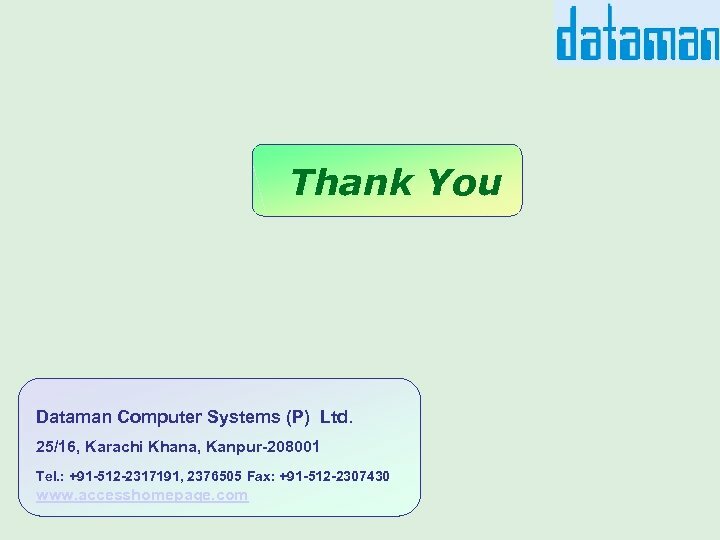 Payment Received Entry : All the payments received in form of cash or cheque or any cheque returned can be feeded here. 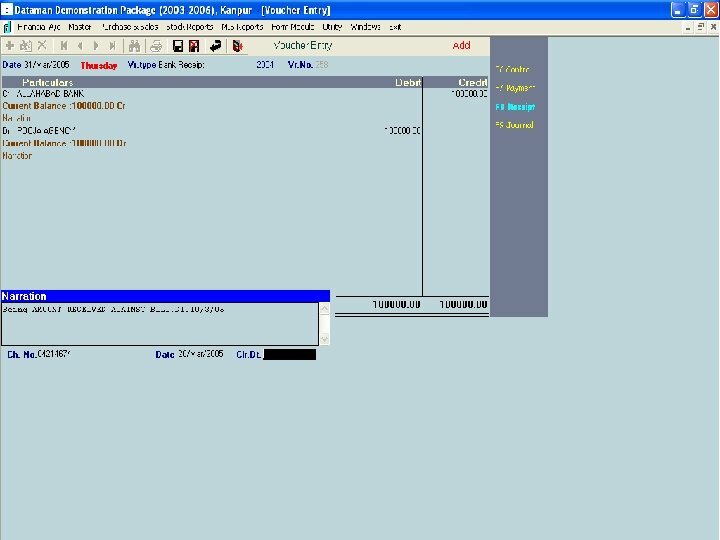 All the bills pending of a Selected party or all parties will be displayed on screen. 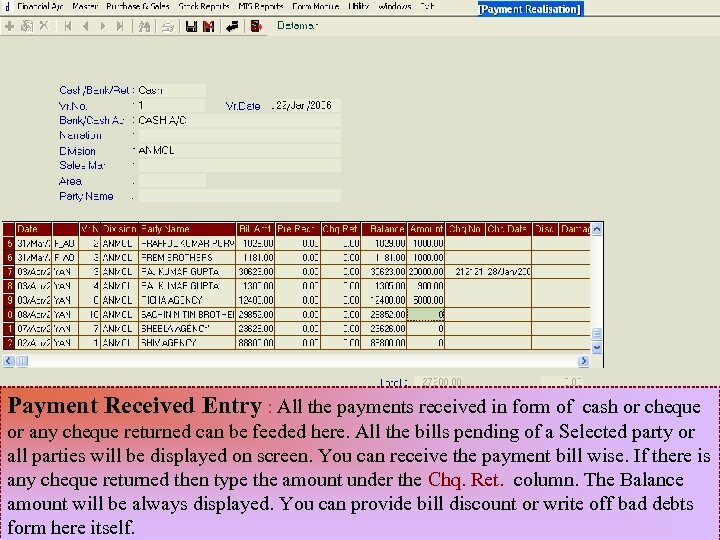 You can receive the payment bill wise. If there is any cheque returned then type the amount under the Chq. Ret. column. The Balance amount will be always displayed. 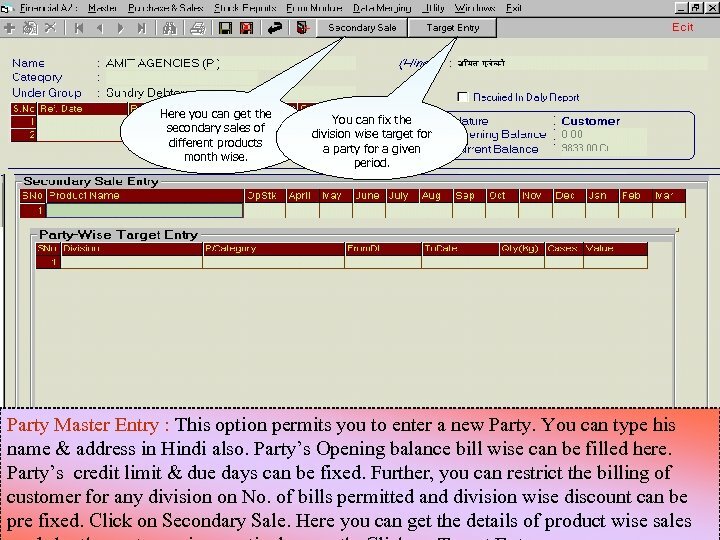 You can provide bill discount or write off bad debts form here itself. 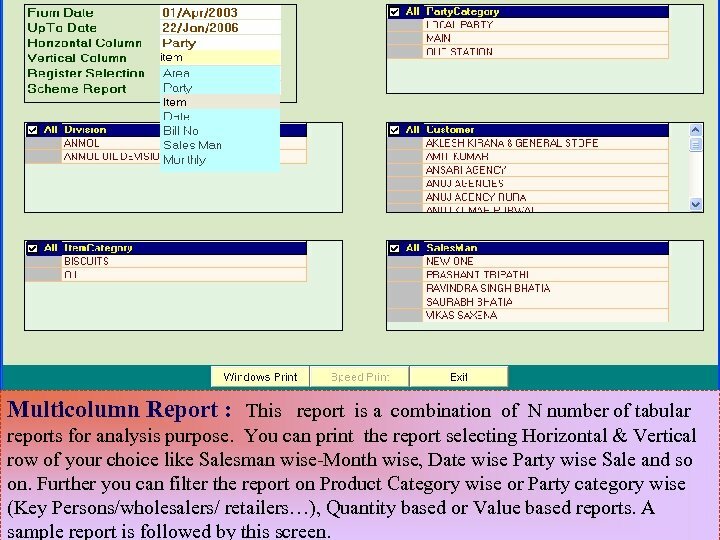 Multicolumn Report : This report is a combination of N number of tabular reports for analysis purpose. 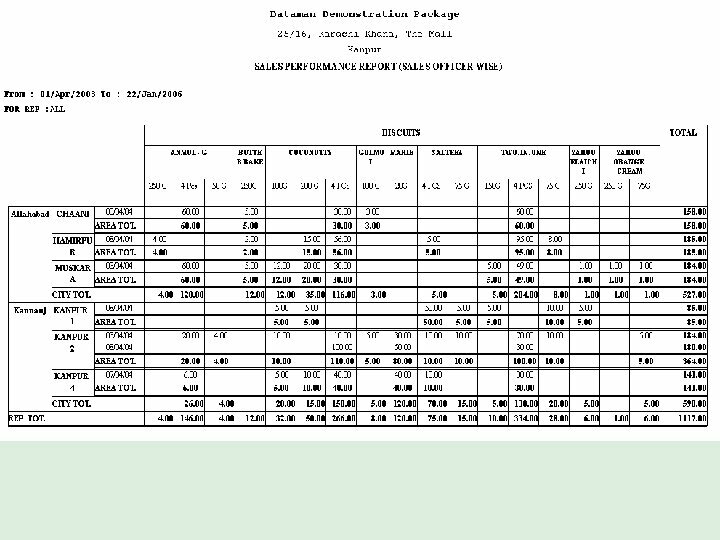 You can print the report selecting Horizontal & Vertical row of your choice like Salesman wise-Month wise, Date wise Party wise Sale and so on. 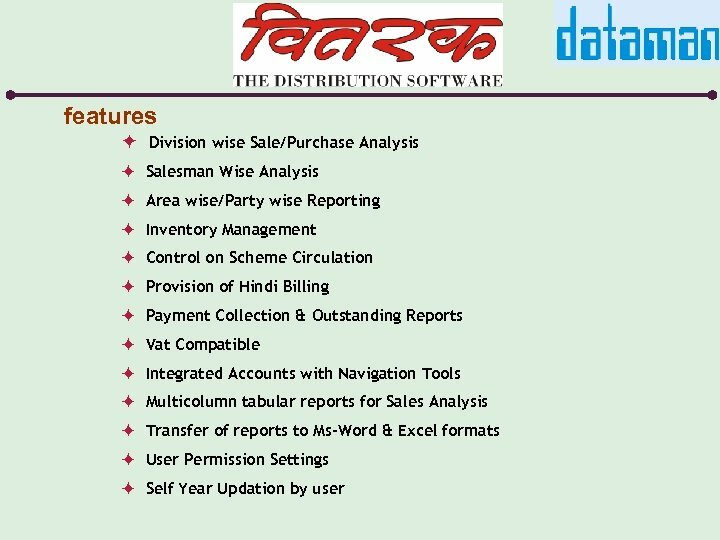 Further you can filter the report on Product Category wise or Party category wise (Key Persons/wholesalers/ retailers…), Quantity based or Value based reports. 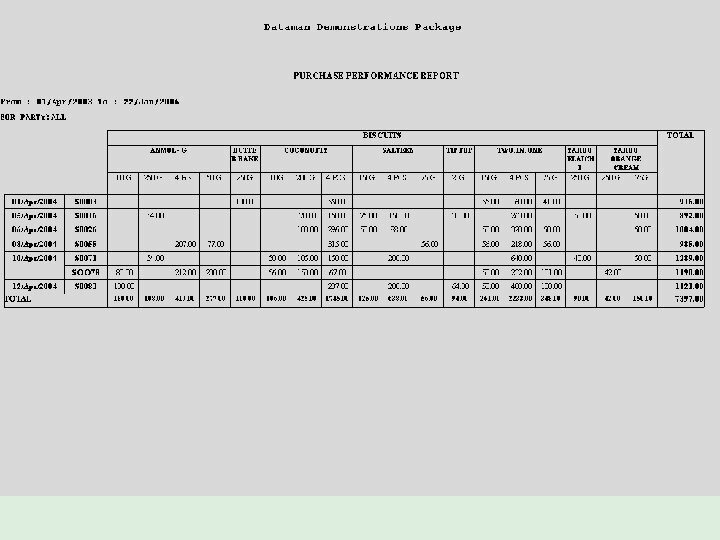 A sample report is followed by this screen. 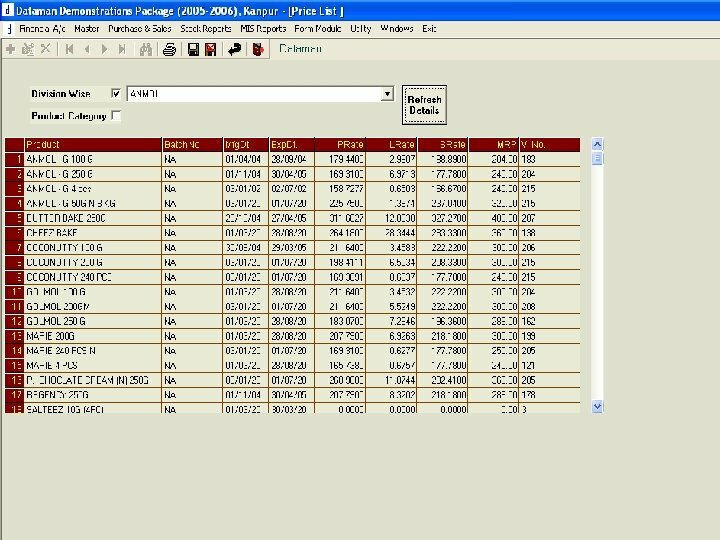 User Permission : Vitrak, allows you to configure as many users you require for a company and then you can fix the permissions for that user to Add, Edit or Delete a record.